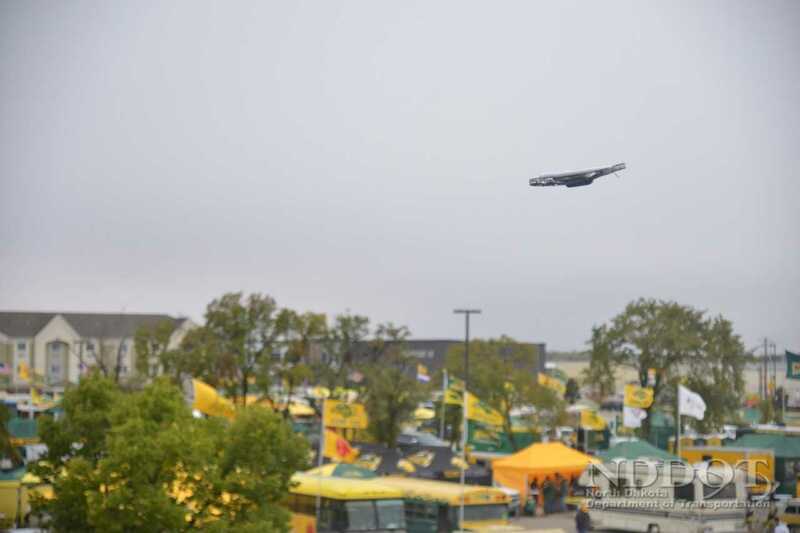 The North Dakota Department of Transportation (NDDOT) and Northern Plains UAS Test Site (NPUASTS) successfully completed its first public mission of North Dakota’s Unmanned Aircraft System (UAS) Integration Pilot Program in Fargo today. Joining NDDOT in today’s mission was Governor Doug Burgum, Congressman Kevin Cramer, Deputy Assistant to the President and Deputy U.S. Chief Technology Officer Michael Kratsios, FAA Regional Administrator for the Great Lakes Region Rebecca MacPherson, Executive Director for Northern Plains UAS Test Site Nick Flom, along with many other project partners. North Dakota’s team conducted UAS (drone) operations with Media and Emergency Response crews in flight over people at a tailgating event in Fargodome’s west parking lot before the North Dakota State University football game on Saturday. The partners working on this mission with NDDOT and NPUASTS include: North Dakota State University, CNN, Botlink, Parazero, AirMap, Cass County Sheriff’s Office, Adams Communication & Engineering Technology (ACET) and others. 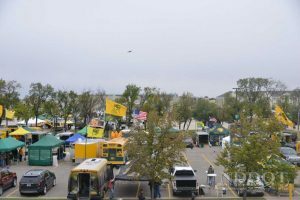 The North Dakota team obtained waivers from the Federal Aviation Administration (FAA) to conduct the UAS flights at the Fargodome parking lot. This is the first phase of North Dakota’s UAS IPP which is designed to help FAA create new regulations that will enable the safe and secure integration of UAS (drones) into national airspace systems. “Safety is our number one priority and testing the safety of UAS systems to see how they can operate in different types of situations is the main goal of this program,” says NDDOT Director Tom Sorel. “This milestone was a collaborative effort between private industry, state government and federal government. We achieved an authorization that not only ensured the safety of other airplane traffic but also the safety of the people on the ground,” says Nick Flom, Executive Director, Northern Plains UAS Test Site. In May, U.S. DOT selected the North Dakota Department of Transportation as one of 10 participants in the Federal Aviation Administration’s UAS Integration Pilot Program. NDDOT and NPUASTS are working together with partners and stakeholders to accomplish North Dakota’s pilot program mission to provide operational efficiencies, create new opportunities, build industry to grow the economy and reduce traffic fatalities and serious injuries. The three-year program gives state, local and tribal governments a chance to establish innovation zones for testing complex UAS operations. The State of North Dakota is a leader in transportation and UAS advancement. The UAS Integration Pilot Program technology will enhance North Dakota in many areas such as pipeline or infrastructure inspections, traffic crash reconstruction, and emergency response during a life threatening event in rural areas, such as finding a missing person in the Badlands or on lakes and rivers. 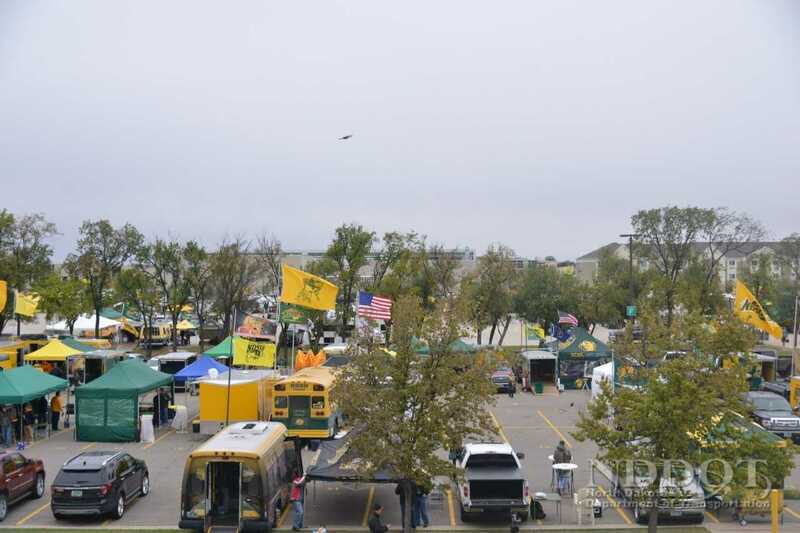 The North Dakota UAS team obtained waivers from the Federal Aviation Administration (FAA) to conduct the uas (drone) flights at the Fargodome parking lots of E, F and G. The use of UAS on the Fargodome grounds are otherwise not authorized or permitted. ParaZero (https://parazero.com/) was founded in 2014 to accomplish a vision to enable the drone industry to realize its greatest potential. ParaZero offers a smart and intuitive solution to enable drone industry growth by designing, developing and providing best-in-class autonomous safety systems for commercial drones.